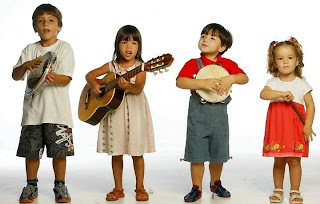 Music and preschoolers just naturally go together. As noted music educator Carolyn Lindeman exclaims, "Music and young children are the best of friends. They're almost inseparable!" Add to that equation youngsters with special needs in the areas of communication and speech disorders, and music strategies that utilize the voice seem ideal for encouraging vocalization, aiding with inflection and articulation and providing venues for communication and socialization with peers. Though federal legislation guarantees all children receive educational opportunities that are both equal and appropriate to their learning needs, it is rare music educators service publically funded preschool programs, and even rarer music therapists - those individuals trained to use music to achieve non-musical goals such as speech-language skill development - are available to work with special needs preschoolers. Therefore, how might the speech therapist and/or pathologist select and engage preschoolers using musical strategies within a therapy setting? In music, prior to singing, youngsters are encouraged to experiment with their voices. Imitations work well, especially animal sounds, because children can "hear" these sounds in their heads. Assorted animals from Old MacDonald's farm might yield the duck, cow, horse, sheep (lamb) and pig plus a token dog and cat. Rather than mimic the contrived sounds in the song, a quick analysis of the actual "sound" each animal makes provides a strong basis for use. For example, a cow's "moo" has an archlike melodic contour, starting low, gently rising and then falling back down. Conversely, the "baa" of a sheep has a descending contour. Each imitation has a good frontal sound, i.e., 'm' and 'b', and requires vocal/pitch inflection. Certain animals' sounds are confined to either a high or low register and are good for children with a monotonic speech delivery. For example, a large dog would have a lower "ruff," which the therapist could encourage the student to initiate. Then, by introducing a smaller dog, it would necessitate raising the pitch register of the "ruff." Often using puppets or pictures of these animals helps the children to see the association between size and sound/register. Another animal sound that works well with minimal range speakers is the "whoo" of an owl. Similar in contour to "baa," it requires the child to "project the voice into the head," creating a siren-like tone with more resonance. Hydraulophone - let's make music with water!